Foreword : The BSA Guide – looking for a UK boarding school? If you have picked up this Guide, and you are a parent, then the chances are you are already well aware of the benefits of a boarding education. You are thinking carefully about what school might be best for your youngster. You want to explore the options fully. This Guide will help you to navigate your way through the process of finding the school that best suits your individual child. Choosing a school can be as bewildering as it is exciting. There are so many good boarding schools offering an excellent education: the boarding family is extended and diverse. You can choose from rural, town, city, boys, girls, mixed, junior, senior, all-through, sixth form, all-around, specialist, flexi, weekly, full boarding, state or independent. Or perhaps a combination of different schools at different ages. The choice is as broad and flexible as the distinctive variety and nature of the boarding sector. What unites all boarding schools is a deep, shared belief in the value that high-quality, modern boarding education can offer children and their parents. Boarding schools offer a unique richness of community. They are open, tolerant, lively places where education happens 24 hours a day. The vibrancy of a boarding community is irresistible and there are myriad benefits as a preparation for life. Children learn how to solve problems, get along with people different from themselves and be at ease with others. This is deep learning – a full education. More than ever, parents are part of the boarding community. Many report the quality of relationship with their children grows through the boarding experience, and the strong links with the dedicated residential pastoral staff who make boarding houses into an extension of home. The Boarding Schools’ Association (BSA) represents more than 580 boarding schools in the UK and overseas. It provides a wide range of services including professional development, government relations, communications, media, publications, conferences and events. This guide springs from the positive and constructive partnership between the Boarding Schools’ Association and Bulldog Publishing. We hope you find it helpful in choosing the best boarding school for your child. 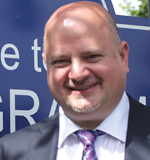 Nick Wergan has been Headteacher at Steyning Grammar School since 2013. Nick was Deputy Headteacher at Blatchington Mill School in Hove, and Head of English at Sackville School in East Grinstead. Nick retrained as an English teacher in 2004, following a successful career in investment banking, specialising in Emerging European Equities, at Morgan Stanley, Merrill Lynch and HSBC Investment Bank. Nick is an elected Fellow of the Royal Society of Arts, National Teaching Awards Winner in 2007 for Outstanding New Teacher of the Year, and co-owner of an award-winning West Sussex vineyard. He is BSA Chair, 2019.